Clothes, stuffed animals, material, sheets, comforters, scatter rugs, shoes and backpacks are all common donations to a Textile Recycling Program. 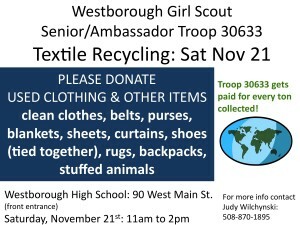 Westborough Girl Scout Troop 30633 will hold a textile recycling event on Saturday, November from 11 am to 2 pm. (Please note time change for this event.) Donations may be dropped off at the main entrance to Westborough High School on West Main Street. At 2 pm the truck from Bags2School will pick up the donations. The textile recycling events held by the troop have been very successful. The 21 members of the troop are planning for a trip in June 2016. In addition to the textile recycling, the troop members are providing babysitting services and collecting cans and bottles for the refund. For information please call 508-870-1895 or email GirlScouttroop30633@gmail.com. The troop appreciates the community support of their trip!